Much of what we know about now-extinct brands of hot sauces comes from bottle collectors. There is not a great body of material on the subject of collectible hot sauce bottles, but we are indebted to Betty Zumwalt, author of Ketchup, Pickles, Sauces: 19th Century Food in Glass, who dutifully catalogued obscure hot sauce bottles found by collectors. Many bottles in the hands of collectors were uncovered from archaeological digs and shipwrecks. Other sources of information about early hot sauces are city directories, which often contained advertisements for sauces, and newspapers. We know from these sources that the first bottled cayenne sauces appeared in Massachusetts around 1807. These were probably homemade and similar to the English sauces with the silver labels. Sometime between 1840 and 1860, J. McCollick & Company of New York City produced a Bird Pepper Sauce in a large cathedral bottle that was nearly eleven inches tall! This sauce is significant because it was probably made with the wild chiles called chiltepins or bird peppers. We also know that in 1849, England’s Lea and Perrins Worcestershire Sauce was first imported into the United States via the port of New York. That year was also important in the history of hot sauces because it marked the first recorded crop of tabasco chiles, the vital ingredient of McIlhenny Company’s Tabasco Pepper Sauce. That crop was grown by a prominent Louisiana banker and legislator, Colonel Maunsell White on his Deer Range Plantation. The New Orleans Daily Delta printed a letter from a visitor to White’s plantation, who reported, “I must not omit to notice the Colonel’s pepper patch, which is two acres in extent, all planted with a new species of red pepper, which Colonel White has introduced into this country, called Tobasco red pepper. The Colonel attributes the admirable health of his hands to the free use of this pepper.” Tobasco was an early misspelling of Tabasco, the Mexican state. Colonel White manufactured the first hot sauce from the “Tobasco” chiles and advertised bottles of it for sale in 1859. About this time, he gave some chiles and his sauce recipe to a friend, Edmund McIlhenny, who promptly planted the seeds on his plantation on Avery Island. Colonel White manufactured the first hot sauce from the “Tobasco” chiles and advertised bottles of it for sale in 1859. About this time, he gave some chiles and his sauce recipe to a friend, Edmund McIlhenny, who promptly planted the seeds on his plantation on Avery Island. McIlhenny’s horticultural enterprise was interrupted by the Civil War and invading Union troops from captured New Orleans. 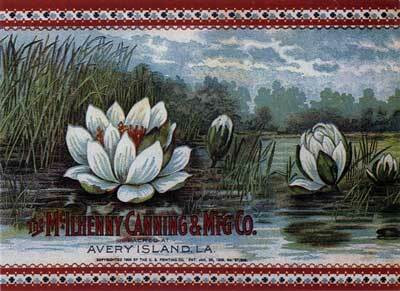 In 1863, McIlhenny and his family abandoned their Avery Island plantation to take refuge in San Antonio, Texas. When the McIlhenny family returned to Avery Island in 1865, they found their plantation destroyed and their sugar cane fields in ruin. However, a few volunteer chile plants still survived, providing enough seeds for McIlhenny to rebuild his pepper patch. Gradually, his yield of pods increased to the point where he could experiment with his sauce recipe, in which mashed chiles were strained, and the resulting juice was mixed with vinegar and salt and aged in fifty-gallon white oak barrels. In 1868, McIlhenny packaged his aged sauce in 350 used cologne bottles and sent them as samples to likely wholesalers. The sauce was so popular that orders poured in for thousands of bottles priced at one dollar each, wholesale, which was quite a bit of money in those days. In 1870, McIlhenny obtained a patent on his Tabasco Brand (as it was now called) hot pepper sauce and by 1872 had opened an office in London to handle the European market. The increasing demand for Tabasco sauce caused changes in the packaging of the product as the corked bottles sealed with green wax were replaced by bottles with metal tops. Around this same time, a cookbook entitled Mrs. Hill’s New Cookbook, by Annabella Hill of Georgia, contained an interesting recipe for barbecue sauce that contained butter, mustard, vinegar, black pepper, and red pepper–almost certainly cayenne. So it is evident that there was a general tradition of home cooking with hot sauces in the South. Mrs. Hill also included a recipe for a curry sauce using prepared curry powder. From an excavated wreck of the good ship Bertrand, dated 1874, we know that Western Spice Mills of St. Louis was making hot sauce around that time because 173 of their bottles were uncovered. That same year (some say 1875), Eugene R. Durkee of Brooklyn, New York, applied for a patent on a hexagonally-shaped “Chilli Sauce” bottle. Although the patent application survives, no actual bottle has ever been found, but E.R. Durkee & Company became a rather large spice and condiment company and the brand name exists to this day. Around this same time, W.K. Lewis & Co. in Boston was producing a pepper sauce in a square cathedral-shaped bottle. During the 1880s and ’90s, several hot sauces sprang up, including C&D Peppersauce, manufactured by Chace and Duncan in New York City in 1883, but we have nothing left but the bottle. Sometime around 1900, the Bergman and Company Pioneer Pickle Factory in Sacramento, California, began selling Bergman’s Diablo Pepper Sauce in five-inch tall bottles with narrow necks that resembled the typical hot sauce bottle of today. From hot sauce bottle collectors we know that Koonyik Chilies Sauce appeared along the west coast of the United States around 1900. About the same time, a Detroit company, Horton-Cato, manufactured Royal Pepper Sauce in a bottle with a bulbous bottom. And sometime shortly after 1889, Heinz produced Heinz’s Tabasco Pepper Sauce in a elegant bottle; but alas, even Heinz couldn’t compete with the “real” Tabasco sauce. After the death of Edmund McIlhenny in 1890, the family business was turned over to his son John, who immediately inherited trouble in the form of a crop failure. John attempted to locate tabasco chiles in Mexico but could not find any to meet his specifications. Fortunately, his father had stored sufficient reserves of pepper mash, so the family business weathered the crisis. However, that experience taught the family not to depend solely upon tabasco chiles grown in Louisiana. Today, tabascos are grown under contract in Honduras, Colombia, and other Central and South American countries, and the mash is imported into the United States in barrels. In 1898, another Louisiana entrepreneur (and former McIlhenny employee) named B. F. Trappey began growing tabasco chiles from Avery Island seed. 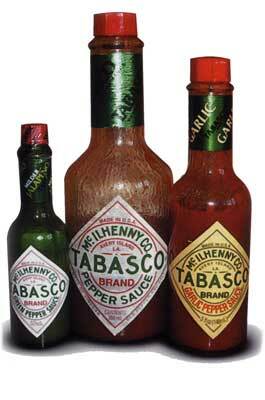 He founded the company B. F. Trappey and Sons and began producing his own sauce, which was also called “Tabasco.” The McIlhenny family eventually responded to this challenge and a several decades-long feud by receiving a trademark for their Tabasco® brand in 1906. Obviously noticing the success of McIlhenny’s Tabasco® Pepper Sauce, other companies sprang up all over the country. Charles E. Erath of New Orleans began manufacturing Extract of Louisiana Pepper, Red Hot Creole Peppersauce in bottles nearly eight inches tall in 1916. A year later, La Victoria Foods began manufacturing Salsa Brava in Los Angeles, California. The 1920s were a big decade for Louisiana-style hot sauce. In 1920, in New Iberia, pepper farmer Adam Estilette and Jacob Frank combined forces to produce Frank’s Louisiana RedHot Sauce. In 1923, Baumer Foods began manufacturing of Crystal Hot Sauce and in 1928 Bruce Foods started making Original Louisiana Hot Sauce. All three of these brands are still in existence today. The Louisiana hot sauce boom continued when, in 1929, Trappey’s expanded to two plants, one in Lafayette and one in New Iberia. That same year, the McIlhenny family won a trademark infringement suit against the Trappeys. From that time on, only the McIlhenny sauce could be called “Tabasco,” and competitors were reduced to merely including tabasco chiles in their list of ingredients. The two companies had competed with identically named sauces for thirty-one years. Undoubtedly because of the Wall Street collapse and the Great Depression, no hot sauce start-ups were uncovered during our research for this article until the start of World War II. 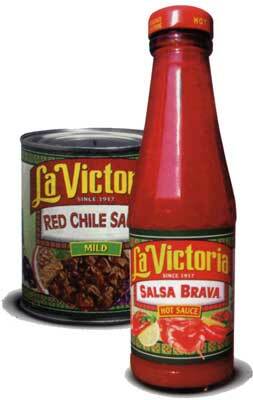 In 1941, Henry Tanklage formed La Victoria Sales Company to market a new La Victoria salsa line. He introduced red taco sauce, green taco sauce, and enchilada sauce–the first of their kind in the United States. He took over the entire La Victoria operation in 1946, which today has ten different hot sauces covering the entire salsa spectrum, including Green Chili Salsa and Red Salsa Jalapeña. In Texas, salsa manufacturing began in 1947. David and Margaret Pace operated a small food packing operation in the back of their liquor store in San Antonio. They were manufacturing syrups, salad dressings, and jellies and sold their products door-to-door. David, by trial and error, began to make picante sauce and test it on his friends. When it was introduced commercially, it was so popular that the Paces were forced to drop all other products and concentrate on the picante sauce. But the salsa business was not easy. During the ’40s and ’50s, hot sauces were sold exclusively in small grocery stores, and manufacturers were always searching for new products. In 1955, La Preferida began manufacturing a line of salsas. That same year, incidentally, the first McDonald’s opened. And in 1958, Cajun Chef, a cayenne-based Louisiana hot sauce, was launched in St. Martinville by the family of George Bulliard. A wave of food change swept the country in the 1970s. Sometimes called the “whole foods movement,” the trend emphasized cooking with fresh, unadulterated ingredients. Vegetarianism increased in popularity, health food stores sprang up all over, and a new concept in selling food was launched–the gourmet retail shop, which specialized in selling exotic, imported foods and products from smaller manufacturers that were not available in the large supermarkets. The stage was set for yet another boom in hot sauces, and this one was led by the smaller manufacturers. Four years later, in Austin, Texas, Dan Jardine began production of Jardine’s commercial salsa, perhaps starting Austin’s reputation (disputed by San Antonio) as the hot sauce capital of America. “Austin is a unique place in the United States,” he said. “There seems to be a lot more salsa companies trying to start here.” A count by Austin American-Statesman food editor Kitty Crider in 1993 totaled forty-eight Austin-made salsas. New salsas and hot sauces began springing up all over the country and some manufacturers went for both the gourmet and supermarket customers. Datil peppers (a milder relative of the habanero) and homemade sauces including them have existed for centuries in St. Augustine, Florida. In 1981, Chris Way opened Barnacle Bill’s in St. Augustine, a fresh seafood restaurant, and he soon made a hot sauce with the datil peppers to serve with his fish and other seafood specialties. Each table had its own jar of Dat’l Do It sauce, but they began disappearing at an alarming rate. Way soon realized that his best customers were stealing the bottles of hot sauce. But then he reasoned that they had to steal it—because he had never offered it for sale! About this same time, Chris was approached by one of his customers, who happened to be a vice president of Wynn-Dixie, a huge supermarket chain. He liked the Dat’l Do It sauce, he said, and if Chris was willing to upgrade his packaging, the Wynn-Dixies would carry it. So was born the Dat’l Do It Company, which now has many products. Between the years of 1982 and 1987, Mexican sauce sales jumped sixteen percent, and Mexican sauces suddenly were at the top of the sauce and gravy category. In 1983, Panola Pepper Company in Lake Providence, Louisiana, began with 2,000 gallons of sauce made by Bubber Brown from his mother’s recipe. That same year, Frank’s Red Hot® Cayenne Pepper Sauce was re-introduced by Durkee-French in an advertising blitz; Red Hot® would eventually challenge Tabasco® for U.S. market share. Also in 1983, Huy Fong Foods launched their hand-processed Pepper Sate Sauce, believed to be the first Asian-style sauce to be manufactured in the U.S. Eventually, the company came out with Sriracha Hot Chili Sauce in a squeeze bottle, which became their trademark product. In 1985, Luther and Chip Hearn founded Peppers to distribute and retail hot sauces, including their own brands. Later, Peppers became a major distributor of products to the Fiery Foods Industry. And to prove just how far afield salsa manufacturing had gone, in 1986 Miguel’s Stowe Away in Vermont launched a salsa line. In April, 1986, Sauces & Salsas, Ltd. began manufacturing the Montezuma® brand of hot pepper sauces and salsas in Columbus, Ohio. The company was founded by coauthor Chuck and over the years established one of the most diverse lines of chile pepper sauces in the world, including the nation’s number one brown sauce, Smokey Chipotle®. Pace should have been even more upset at Rosarita’s Salsa. Their slogan was: “Enjoy a change of pace.” Pace and Pet settled out of court in January, 1988, after Old El Paso agreed to change the bottle and label. Pace also launched its famous national television campaign against its rival, where the cowboys mock the “made in New York City” attributes of an imaginary rival sauce. The campaign caused Pace to gain major market shares in the Midwest; coauthor Chuck reports that Pace Picante Sauce hurt his Montezuma® sauces and became number one in the Ohio market. In 1987, Pace saw a major rival enter the fray as Geo. A. Hormel & Co. licensed the restaurant’s name and introduced Chi-Chi’s brand; it would eventually capture a large share of the market. The same year, Robert Spiegel, Dave DeWitt, and Nancy Gerlach founded Chile Pepper magazine, which would become the major national publication to feature hot sauces, their recipes, and advertisements for many manufacturers, large and small. The following year, Lisa Lammé opened Le Saucier in Boston; it is believed to be the first retail shop devoted to sauces and specializing in hot sauces. Macayo Foods of Phoenix introduced a line of taco sauces in plastic pourable bottles that same year, and the first National Fiery Foods Show was held in El Paso. That show, which started with a mere thirty exhibitors, would expand to 250 exhibitors in 1996, showcasing hundreds and hundreds of brands of sauces and salsas along the way. In 1989, Greg and David Figueroa introduced Melinda’s Original Habanero Pepper Sauce to U.S. chileheads, and the habanero mania began. Hundreds of brands of other habanero sauces were manufactured in the years that followed, but Melinda’s is still the number one brand of sauce featuring that chile. Between 1985 and 1990, Mexican sauce sales grew seventy-nine percent; between 1988 and 1992, the percentage of American households buying salsa increased from 16 percent to 36 percent. And despite the claims of Austin, the real Mexican sauce capital of the U.S. is Los Angeles, which gobbled up 3.3 million gallons of it in 1990. This appetite was due to numerous immigrants living in east and central parts of the city and salsa’s enormous supermarket appeal. In 1990, Pace Foods sent 2,000 bottles of their Pace Picante Sauce to U.S. troops in the Saudi Arabian desert. “Many of the soldiers complain about their bland C-rations,” said president Rod Sands. The following year, the first Austin Chronicle Hot Sauce Contest was held at the Travis County Farmer’s Market. It was billed as Austin versus San Antonio. “San Antonio hot sauce is world famous,” said Mike Hood of the San Antonio Current, “while Austin makes designer sauce for yuppies.” Robb Walsh of the Chronicle fired back: “San Antonio sauce is like Christmas, it only comes in red and green.” Austin won the competition, and the contest now has entries from all over the country. By 1992, the top eight salsa manufacturers were, in order: Pace, Old El Paso, Frito-Lay, Chi-Chi’s, La Victoria, Ortega, Herdez, and Newman’s Own. Pace owned 32.3 percent of the market, according to a study by Information Resources, Inc., and published in The New York Times. The market share figures change when different sources are consulted, but Pace is always in the lead. Pace spent $10 million in advertising in 1992 to maintain that lead, outspending Pet Foods’ $5 million for the Old El Paso sauce lines. That same year fifty new salsa products were introduced in Texas alone, including new brands or additional products by established brands. By 1993, competition from the smaller salsa companies was so fierce that Pace, Old El Paso, and a total of six of the top ten brands saw Texas sales decline three percent from the year before. During the first seven months of 1993, according to New Product News, 147 new salsa products were introduced, including Heinz’s Salsa Style Ketchup, and this number is only the reported new products. Also in 1992, Pace Foods pulled off the unbelievable, coals-to-Newcastle coup of marketing their picante sauce in Mexico! It all happened because the company shot a Spanish-language commercial in Mexico City and brought along 350 jars of sauce as props. When the shoot was over, Robert Burke, the marketing director of Pace, left the display behind and told the grocer to keep the jars as a gift. Several weeks later, the grocer called to say that he had sold every jar and wanted more. Such a serendipitous event caused Pace to begin distribution in Mexico, which supports the theory that a maturing Mexican population (in terms of prepared foods) is creating a non-traditional market. Also in 1992, Dave Hirschkop launched what is believed to be the first sauce using significant amounts of oleoresin capsicum (chile “extract”). Dave’s Insanity Sauce became an enormous hit and created a subset of the hot sauce industry, the super-hot sauces. Dave’s Insanity Sauce was so hot that there were incidents of overserving that severely burned people out and caused one known fainting. Show producers Dave DeWitt and Mary Jane Wilan refused to allow the sauce to be tasted at the subsequent show and Hirschkop responded with a new ad slogan: “The Only Hot Sauce Ever Banned from the National Fiery Foods Show.” Sales boomed and have never slowed. Originality in marketing to gain a sales edge became very popular after this incident, and in 1993 Original Juan Specialty Foods introduced their “Pain is Good” line with their “Sultans of Sizzle” screaming faces label. In 1994, another independent distributor of hot sauces and other fiery foods products came on the scene when Dave Lutes launched Hot Shots, which ten years later had 1200 retail customers. The biggest news in 1994 was the buyout of two of the largest companies in the Fiery Foods Industry. The number one salsa manufacturer, Pace Foods, was sold to Campbell Soup Company for an astronomical $1.1 billion. The sales figure is approximately five times Pace’s 1994 estimated sales of $220 million–an amazingly high sales multiple. In even a larger deal, Pillsbury, a division of the giant British food and beverage company, Grand Metropolitan PLC, announced that it would purchase Pet Foods, maker of Old El Paso Mexican foods. The sale price? A cool $2.6 billion. Terry Thompson, a spokesperson for Pillsbury, called Old El Paso “one of the crown jewels” of brand names, the market leader for all retail Mexican foods. Together, Pace and Pet controlled about half of the market for Mexican sauces. “The overall Mexican sauce and foods categories are growing by leaps and bounds,” said Kevin G. Lowery, a Campbell spokesman. “They are among the fastest-growing categories in the entire food business, both retail and food service. One reason for this is electronic technology, which has spread the word about salsas and spicy foods to a new audience. Also in 1994, Ashley Food Company introduced Mad Dog Inferno Hot Sauce, a sauce with extreme heat but a good flavor. Two years later, John Hard launched CaJohn’s Fiery Foods with innovative design and packaging paired with tasty products of all heat levels. During the past ten years, the Fiery Foods Industry has had its share of launches, mergers, and other changes. Impressed with the sales of what had been almost exclusively American hot and spicy products, foreign companies have launched competing lines, like Cholula Hot Sauce, made in the Mexican state of Jalisco. Its claim to fame is a wooden cap that distinguishes it from all other hot sauces. Nando’s Peri Peri, a Portuguese-style South African hot sauce made with African birdseye chiles has begun marketing efforts in the U.S. Its unique selling proposition is a unique citrus flavor that come from lemon puree added during the manufacturing process.